That looks cozy, comfy. Cats rule! She certainly rules at our house! Perfect. Comfort given and received. Lovely shot. This is such a lovely photo! It’s a perfect illustration of the comfort given and received by our pets. Thanks Theresa. Pele is a blind, feeble 18-year-old cat and beloved pet. She is still a comfort to me. 🙂 Thanks as always for stopping by. Very sweet comfort. Give me the comfort of a kitty any old day. Lovely photograph. One of the sweetest and endearing photos I’ve seen. This tender moments are what makes us smile at the end of a hard day. It brings us comfort knowing someone will be there to warm us with their love and affection. My friend, wishing you days filled with blessings. I’m glad you like the photo. 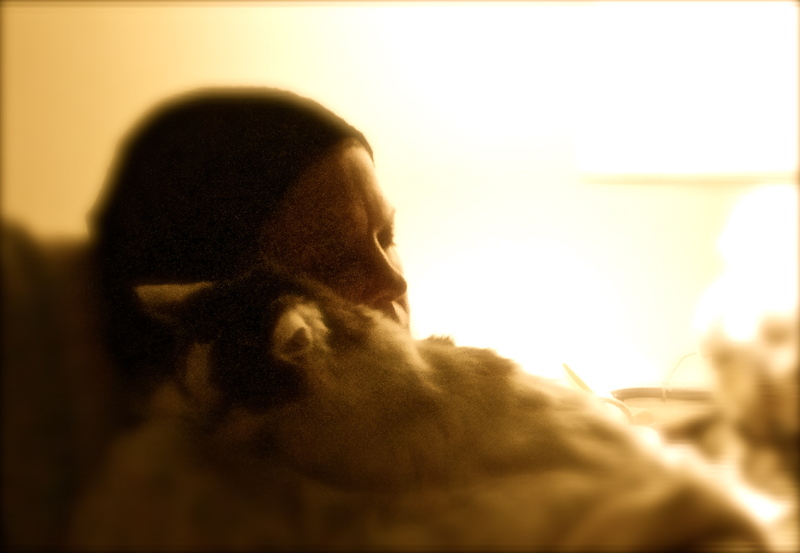 It is one of my favorites, maybe because it is a self-portrait with my cat who has been with me for 18 years. She does indeed bring comfort and affection. Of course, from time to time I have to reassure Richard that he is still top dog in my house! 🙂 Thanks for stopping by, and blessings to you, too. Thanks. It was an experiment that exceeded my imagination. 🙂 I really like it when that happens! Yes they do. Thanks for stopping by. Finally catching up with blog comments. Bear with me. 🙂 Will return! 🙂 I’m glad you like it! Thanks for stopping by. Much appreciated. Yes, you are right. It is bliss. Thanks for stopping by, Isadora. I appreciate it. Thanks frizz, 😉 I’ll pass that along! Thanks for stopping by. I love this shot. Just so natural and true and you and your kitty just look so comfortable. What a peaceful moment. So glad it was captured. 🙂 And thanks for sharing it. Thanks Katie. I love this shot, too. Pele has been with me for 18 years. This shot really does represent comfort to me. I’m glad you like it. 🙂 Yes, I agree. Pele has been with me for 18 years and continues to be a comforting companion. And Richard, my husband of 10 years, likes her, too! so soothing to have a cat as companion! Yes, it is. I miss my cat very much. AND, I’ve noted yours. Beautiful companions, I agree.